It’s been quite a year, with turmoil, violence, suffering, and uncertainty affecting too many parts of the world. I usually welcome the opportunity December brings to reflect on what’s been happening and what may lie ahead. While I am by nature optimistic, I am extremely concerned that the forces of intolerance and isolationism seem to be gaining ground. It’s a challenge for me to understand how quickly real measures of social progress can be reversed and open deep divisions among people in so many places. Whatever my personal beliefs, our focus here is on the leadership of volunteers – and there is a lot to say about the role of volunteers in an uncertain world, no matter your beliefs. When things seem dark and cloudy, history tells us that volunteers can be the bolts of lightning that can turn things around. In our book, By the People: A History of Americans as Volunteers, Katie Campbell and I document how volunteers are always pioneers and mavericks, on the cutting edge of change as well as later being supporters of established institutions. Some changes happen quickly, others take decades. And there are few straight lines to progress. Setbacks and detours cause delays – often because of the work of other volunteers with opposing views. While volunteers give their time and talents to causes they see as working towards social good, the fact is that “social good” can be defined by different people in different ways – and people mobilize the same way on all sides of an issue. Volunteering is not inherently “right” or even “good.” It’s a matter of perspective. I’ve observed that activists campaign equally for every political party. Further, volunteers can be pro-choice or anti-abortion, for or against school vouchers, for or against bilingual education – and so on for centuries. Volunteers can be capitalists, progressives, and of all religious faiths. Their only common denominator is elbow grease. At some point they are willing to put in time and effort to make something happen to further their view of positive progress. Some people are happy with how elections around the world turned out this year. Their voices and their votes have been heard. For those licking their wounds, it’s time for them to be close observers. Not to contest legitimate elections but to monitor the actions of the winners and challenge egregious decisions. To protest and, whenever possible, suggest new solutions to continuing problems. Silence is capitulation. Years ago some leaders in our field praised volunteers as the “silent heroes.” I disagree with that: change occurs when people are willing to be noisy and determined! I’m not referring just to election politics. All volunteering is political. I sincerely believe that volunteering is a way that people demonstrate what matters to them. Writing a check may be an important contribution, but it’s impersonal. Rolling up your sleeves and showing up in person (even if it’s by spending hours online for a cause) is a way of fighting for your vision of a better world. Volunteers who work in hospitals contribute to better health care. Those who coach youth sports want to raise healthy children who understand teamwork. Those who teach illiterate adults to read want to better their students’ lives. I can go on and on. I say to leaders of volunteers: whatever your organization does, you can stress this important perspective of volunteering. Recruit new volunteers by offering the chance to make a difference; thank current volunteers by identifying how they are part of the battle for change; stress to your executives how volunteers are advocates and ambassadors to the community for the mission of your organization. If people are frightened by what they think lies ahead, position volunteering as a way to join with others who feel as they do. It’s motivating because it’s true. Let’s also take heart in how many people give their time to making people feel good. Here in the U.S. we’ve just watched Thanksgiving Day parades in which thousands of volunteers marched, created floats, held down giant balloons, and played band music, even under threats of possible terrorism. In the same way, uncountable community events, from concerts to flea markets, happen throughout the year because of the efforts of volunteers. Thank goodness! Note, too, that many human services volunteer assignments are focused on ways to bring a smile to those served, brightening the day of someone homebound, or ill, or alone. Volunteers are often the connectors who help individuals to interact with institutions in which employees are too busy with the demands of providing services. In natural and manmade military disasters, volunteers bring hope and strength when victims feel at their worst. We can count on volunteerism to bring us together, even in the most divisive environments. Because I, as most of the writers and trainers in volunteer engagement do, spend much of my time discussing how to create skilled and effective roles for volunteers, it’s easy to assume this means that “being friendly” is somehow an old-fashioned way to ask someone to give time. Not at all! In some cases, a smile, a small act of kindness, and a listening ear can be as critical to someone’s well-being (and to social cohesiveness) as any formal, professional care. Nothing has changed for these volunteers, so take heart. So here’s my end-of-year wish for everyone. May we see and celebrate the actions of volunteers that brighten our world. May we recognize that volunteers are not always on the winning side of a cause. And may we start 2017 with renewed energy to strike lightning where needed! Have you been feeling defeated (or happy) about world events? How do volunteers give you hope? What can you do in 2017 to make sure that all volunteer contributions make a true difference? Thanks, Susan, I needed that. Hurrah Susan. Thank you for this energy boost. While I have been railing about the plight of formal organisations and their obligations to government and funders, I am also noticing (in my country at least) a rise in 'local community development', which might start via a social media page and then lead to physical meetings and action. It's like a period of renewal, showing promise of more to come. Yes, Sue, we all need to shine a light on the citizen actions around the world that focus on community life and lead to renewal. Thanks! Some lovely, inspiring words Susan. Thanks so much. Will certainly be sharing these sentiments across our organisation to remind us of the significance and importance of the choice that volunteers made in volunteering for us. And the hope that they represent in that regardless of what is happening they still turn up and do amazing stuff. 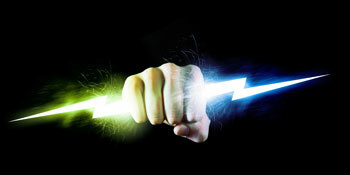 I will be challenging our volunteers to be lightning bolts! Thanks, Susan, for the inspiration. And thank you both too, Damian and Melody. The more people who share this positive message, the better. Defeated/Happy: There is much sadness in the world. However, I was reminded at a rally/march on December 12th, as I talked to baby boomers and millennials, some of us have been doing this a long time and some are bringing new energy. Volunteers/Hope: About three quarters of my 20 plus years as a volunteer leader involved working within highly structured healthcare volunteer services programs. Therefore, I was inspired to learn about over 20 smaller organizations at an event a friend invited me to on December 17th - Forward Union Fair (a political and community action info fair). They are more the “noisy and determined” front. At almost every table we visited they presented opportunities to volunteer moving forward. The good news is my friend was able to discuss volunteering that will tap into her artistic talents – her way of “taking action”. 2017/Paid Staff Tip: I started a volunteer assignment this past September. Love how the one staff member always makes sure she knows the names of the food handler volunteers that evening and introduces us before we serve dinner to the LGBT elders. Susan J Ellis, Energize, Inc., Philadelphia, PA, U.S. Thanks for sharing your personal experiences, Jerry. Yes, there are new people rolling up their sleeves!